Solar powered cars have long been the dream of early adopters of this renewable energy source. Now, a small group of enthusiastic people are planning to ship these part bicycle, part electric powered, and of course part solar powered vehicle. You know something is right about this when they decide to use 45% recycled aluminium as a construction material and provide 30-60 watts of solar power on the rooftop. Off the shelf parts from sturdy mountain bikes helps to make this a low cost, easy to maintain, and potentially easy to assemble vehicle. Easy to assemble and ship makes the potential to grow quickly in all parts of the world quite feasible. Building the company from the ground up using a new, more "organic" method of democratic financing, in the use of Kickstarter.com, also inspires, as other would be dreamers, designers and others see the potential success of this social venture. According to their web side, the ELF is designed with the busy commuter in mind. The ride height puts you in sight of other drivers while the body is still slim enough to navigate bike trails. There is plenty of room to stash your laptop case and pick up several bags of groceries on the way home. Recharge the removable battery pack by parking your ELF in the sun or by plugging it in to a standard outlet. Upgrade to a more powerful solar panel to stay off grid or add a NuVinci 360 hub to ease your ride. Additional upgrades and features will be available. Got more industrial delivery ideas in mind for your transportation needs? 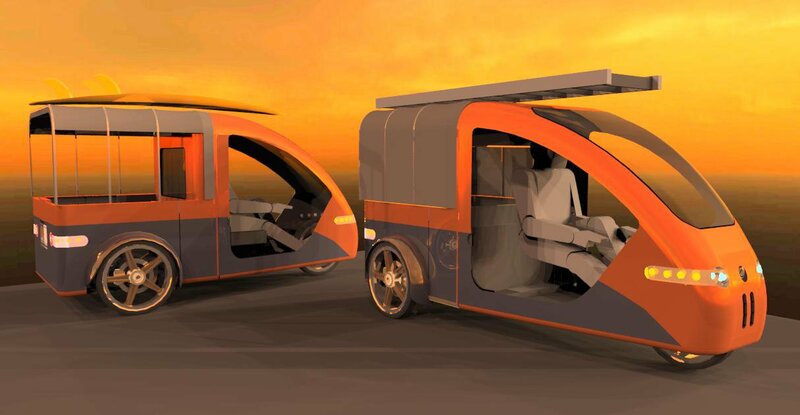 Check out the truck version of this solar vehicle. The Truckit is a more rugged vehicle designed for the light delivery market. Whether your business is flowers or hot meals, the Truckit can save you big money on local delivery. This OTV can carry over 800 lbs and can be customized with hot/cold boxes, a lockable trunk, extra shelving, or whatever you might need to make the Truckit fit your business.